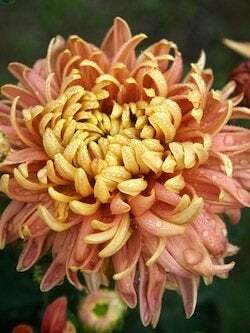 Boldly colored mums on porches or planted in garden beds are wonderful harbingers of fall, going hand in hand with that nip in the air, the turning leaves, and the children in their back-to-school clothes. Unlike mums found in a florist’s shop, garden mums prefer cooler temperatures and continue blooming well into fall. Buyers should be aware that while mums may be on our minds right now, this time of year is not ideal for planting. 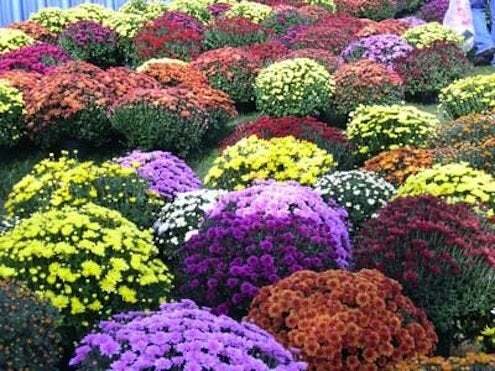 “Mums have two cycles, reproductive (flowering) and vegetative. They are vegetative when days are long and reproductive when days are short,” says Ray Gray of King’s Mums in Oregon City, OR. “We only sell our plants in the spring (March through June), when they are in their vegetative cycle. This ensures that they will be vigorously developing new roots and be in good condition to survive over the winter.” If you want your mums to act like the perennials they are, spring planting offers better conditions. Still, if you didn’t think ahead last spring, you may still have a shot at coaxing these beauties into returning next year. First, buy your mums from a nursery or independent garden center, as the varieties sold in grocery stores and flower shops are usually not hardy enough to withstand winter. Plant your mums in a sunny spot away from artificial lights and give them lots of water, especially right after planting. Good soil drainage is important; mums will not thrive in soggy soil. The mums should bloom through the fall until a hard freeze. Deadheading the spent blooms will encourage new ones to flourish. Insulate mums for colder weather by spreading a couple of inches of mulch or straw over the beds, but be sure to remove it in late winter so you don’t inhibit the plant’s springtime growth. “My understanding is that the problem with mums in the winter is being wet, not cold,” says Jan Pavlinak of Bluestone Perennials. Too much mulch will hold in moisture, which “blocks the plant instead of protecting it.” Pavlinak suggests going easy on the mulch and making sure to leave the crown of the plant open (or very thinly covered). If all of this sounds like a lot of work on a gamble to you, there is yet another option available: Buy your mums where and when the mood strikes, enjoy them for the season, then say goodbye. For info on on the growing habits and care requirements of some of our favorite varieties, don’t miss 10 Low-Maintenance Mums.